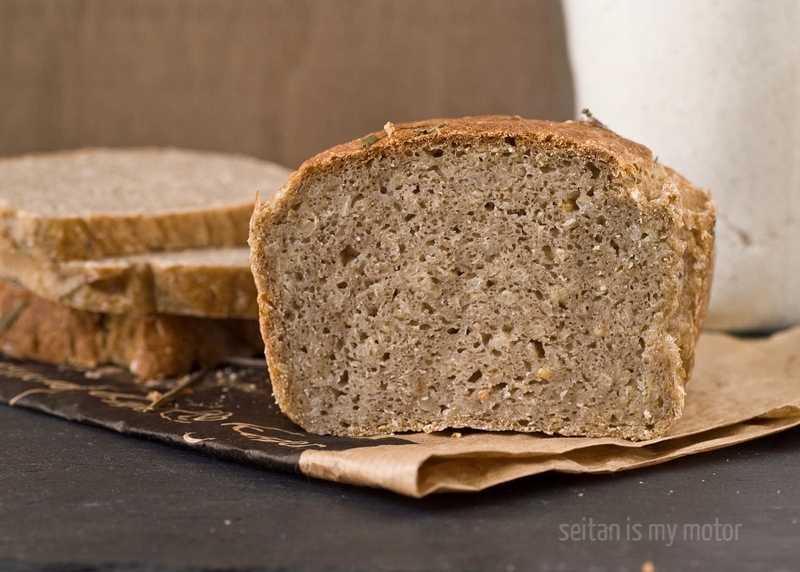 When I started bread baking and blogging about it, I got several requests for gluten-free bread. I once made one, but generally told people they should look somewhere else. I didn’t consider myself an expert in gluten-free baking. And I was afraid of it. 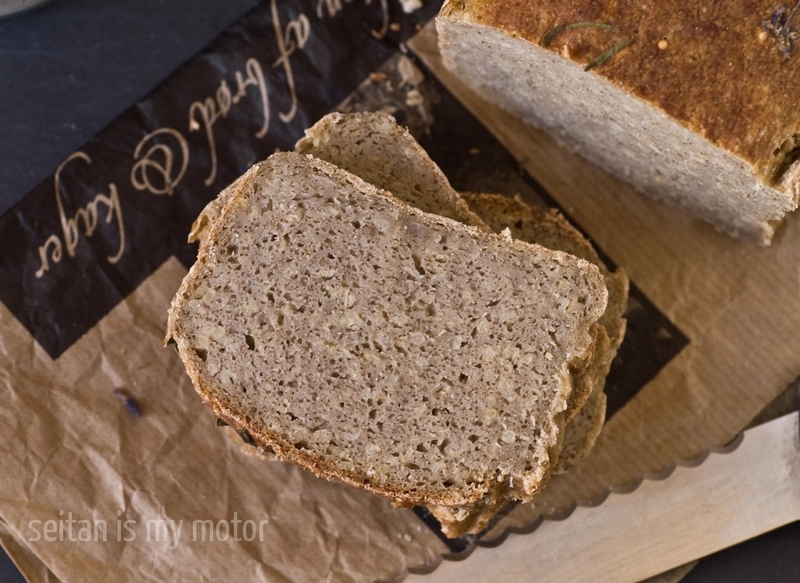 Isn’t gluten the most important element in a good bread? How where you supposed to knead it and shape it when there was no gluten? Wouldn’t it all fall apart? Or just turn into a brick? But when I made my last sourdough recipe, it occurred to me that 100% rye breads are very similar to gluten-free breads. The gluten in rye is weak and not very reliable. You need sourdough to help stabilising the bread. The dough is very sticky and when you try to shape your baked rye goods, you have to do it with wet hands and it’s best to bake them in some kind of pan. But rye breads, especially when made with sourdough starter, whole grains, and soakers, are very moist and keep fresh for long. Gluten-free breads however tend to dry out easily because there is not much to keep them retain water. They usually contain a lot of starch, finely milled flours and nothing to keep much moisture. 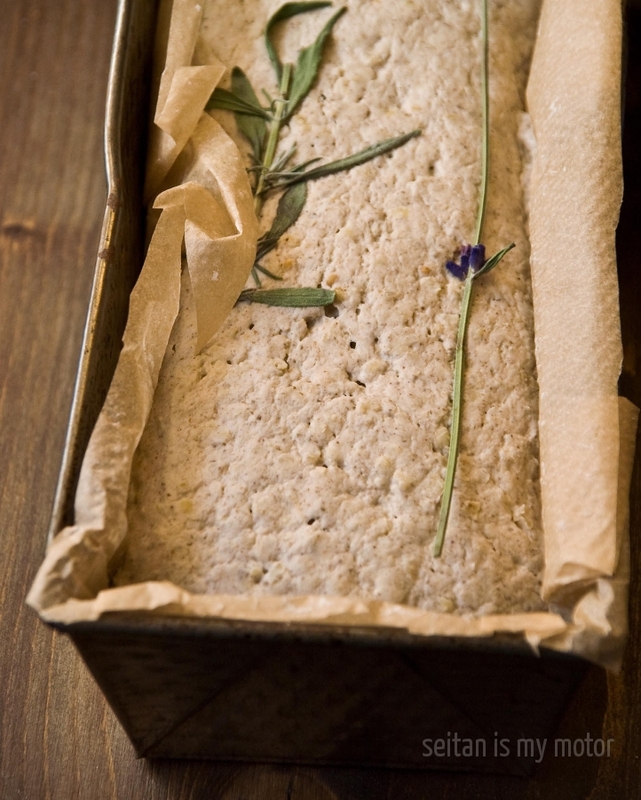 But what would you do if you wanted a moist and lasting gluten-free bread? Add a starter and a soaker! So I looked online for gluten-free sourdough starters and found the weirdest stuff. Many people seem to make them with commercial yeast. These are not sourdough starters though. They are preferments. And they will probably die sooner or later if you treat them as starters. (The commercial yeast messes with the microorganisms and wild yeasts in the starter. It eventually kills them.) I also found recipes that used some commercial kind of ferment or starter. But that means you are not making your sourdough from scratch. And you have to search online for an expensive ingredient that is not necessary. All you really need is flour and water. In theory it doesn’t matter what flour you choose as long as it has starches. * And you will find those in all flours. Your flour-water mixture also contains microorganisms (especially lactic acid bacteria). These microorganisms convert the starches first into sugars, then into lactic acid. Lactic acid is responsible for the sour taste of your starter and the sugars feed the wild yeast in your starter. Those yeast are responsible for leavening the dough. *Of course it depends on many things if your starter will thrive. Temperature, moisture, flour properties, etc. Some flours catch mold easier than others. 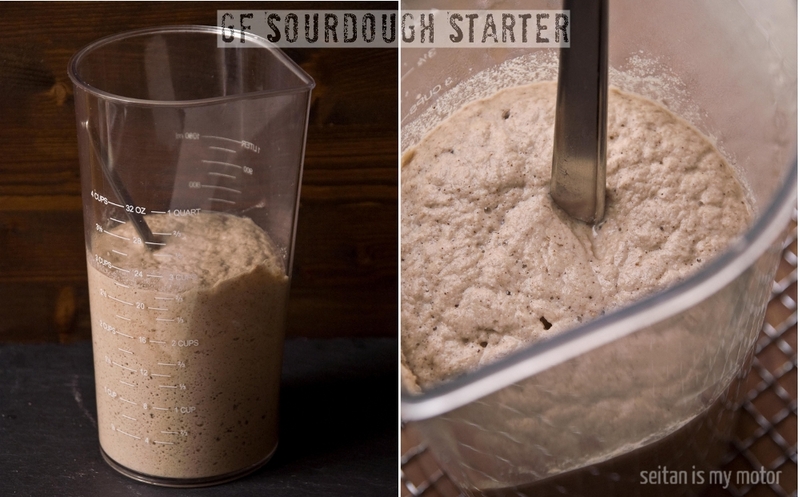 Sometimes it is necessary to try a couple of times until you get your starter going. The presence of so many starches in a regular gluten-free flour mix is probably why I had so much success with my first gluten-free starter. Or maybe it was the warm weather. I really don’t know why, but I was very sceptical at first and thought I would certainly end up with a batch of mold and not a bubbly starter. I used my regular sourdough starter recipe with a gluten-free flour mix I found online on a fantastic German blog on gluten-free baking. The gluten-free flour mix called for some ingredients I didn’t have on hand, so I looked for them at the health food store. I didn’t find teff flour, which is as hard to find over here as sorghum. Instead I got some lupin flour (not called for in the recipe) and grape seed flour. I already had buchwheat and millet at home, also tapioca starch, cornstarch, and locust bean gum. I fed it for two more days until the starter smelled sour. My regular starter usually smells like apples. This time the smell was more like buttermilk. But that is okay. It seemed to be good! You can probably use whatever flour mixture you have on hand. I thought the buckwheat and millet flour were great in this as they later gave the bread a stronger taste that reminded me of rye bread. If you use buckwheat you should know that it can dye the starter slightly red on the surface. That is normal. Don’t throw it out because you think it is mold! Now finally let’s get to the bread. For this I first made another flour mix for bread. Combine all ingredients and mix well. Store in an airtight container. Please note: the measurements are metric only because that way they are easier to swap. If you measure with cups and make some substitutions, you might end up with a completely different ratio. If you have no idea what psyllium husk is, I have written a bit about it here and here. Combine millet and water in a small pot and bring to a boil. Cover and let cook for 2 minutes. Turn off the heat but don’t remove the pot. That way the millet gets cooked and you can use it once it is at room temperature. (Yep, that is some lavender on top.) Preheat your oven to 220°C. Boil half a cup of water right before you want to place the bread in the oven and fill it into a mug. Make sure to wear oven gloves, so you don’t burn yourself. Place the bread in the oven. Quickly pour the water onto the bottom of the oven. (You can also place a rimmed baking sheet on the bottom rack while the oven is preheating and then pour the water into that baking sheet.) Close the door and let the dough bake for 20 minutes. Then reduce the temperature to 200°C and bake for another 35-40 minutes. Doesn’t this just look like a perfect bread? This entry was submitted to YeastSpotting. This bread looks pretty great! I like the blend of flours you used. I have also used a similar combination of psyllium husk and chia seeds. It gives the bread great flexibility. Hi Gina, no I haven’t tried that but it looks so much easier! Thanks for the tip. Sorghum flour is super hard to find in Germany. But I could try teff. I am a bit on the cheap side, and worried about investing in so many different items for one bread. Is the buckwheat safe for wheat allergies, as gluten allergies often go hand in hand with wheat allergies also? Are all of the ingredients necessary for the starter? My starter has so many different ingredients because I made my own flour. Theoretically it should work with any gluten-free flour mix or your own favourite flour, but I haven’t tried it. If you want to make a bread suitable for people with a wheat allergy, you could also make a 100% rye sourdough bread. That way you don’t have to buy too many different ingredients. Wow, dude, you blow my mind with your bread baking skills! Da ich schon längere Zeit kein Brot mehr gebacken habe, muss dieses Rezept einfach schnell nachgebacken werden, denn es klingt und sieht einfach zu köstlich aus. That is a gorgeous gf bread Mihl. So hearty and still looks soft and moist. I agree with Celine. :) This looks and sounds perfect. Thanks! You are a wealth of bread baking knowledge. I didn’t think it was possible to make gluten free sourdough, but you proved me wrong. I really need to experiment more with gluten free baking, it’s about time I get over my fear of it. You really need to write a yeast bread book, missie. Only if that book is gonna write itself, ha.